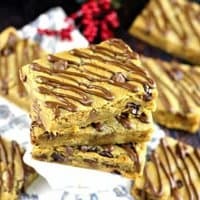 Jelly Swirled Peanut Butter Bars! Omg…these are freakin’ awesome. Don’t be ‘jelly’! 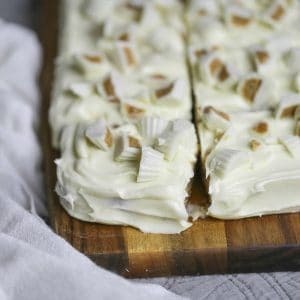 You can make these too, and they will soon be your new favorite bars, I promise. Here’s some ‘ChocolaTess Trivia’ for you! 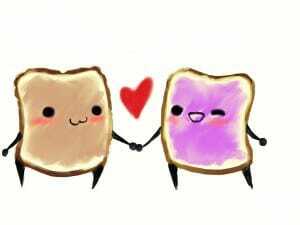 Did you know…The average American will eat 1500 PB&Js before they turn 18!? The study was performed by Prepared Foods. Want to know more PB & J trivia? Go here for “11 Things You Didn’t Know About Peanut Butter & Jelly”. 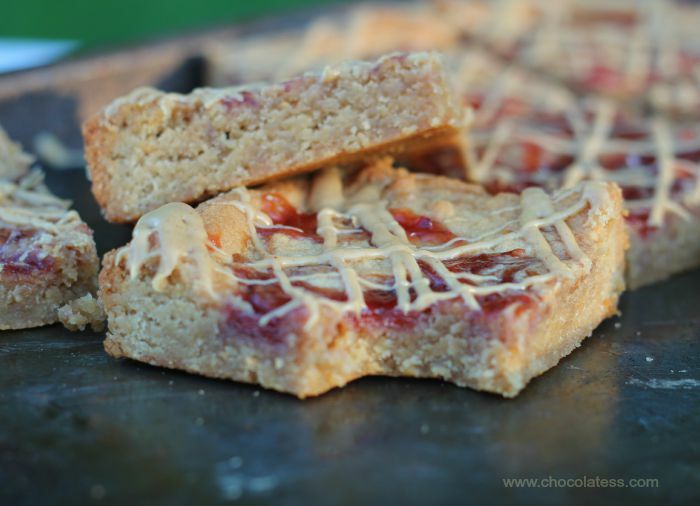 If you’re even remotely a peanut butter & jelly fan, you will definitely go bonkers over these. Make them any flavor of jelly you want. Seriously, you have to try these. Peanut butter and jelly is such a staple at home, especially for brown bag lunches and afternoon snacks. I hope you’ll give these a try. The kiddies will love these for sure. at PBJ & Carry on! Here’s the recipe! Spray with non-stick spray an 8x8 or 9x9 pan, set aside. Using mixer, cream butter, peanut butter, and brown sugar. Add egg and vanilla, and mix well. 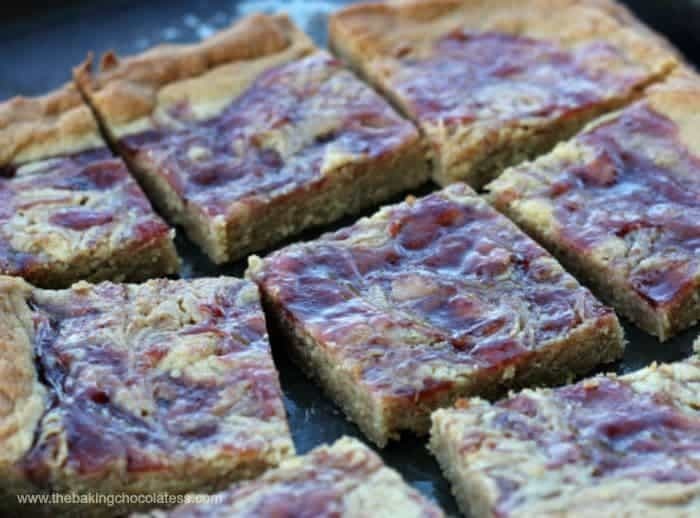 Drop peanut butter and jelly in spoonfuls on top of dough. Use a knife to swirl the two together into the dough. Melt peanut butter in microwave for 15-25 seconds. Drizzle warmed peanut butter on top of bars. (I used a pastry bag, cut out a small hole and drizzled back and forth across bars. 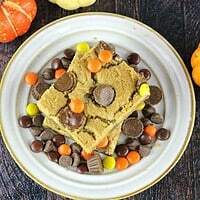 If you love peanut butter, you might wanna check these nom-noms out! Yum! I love all things peanut butter. These look like a delicious treat! 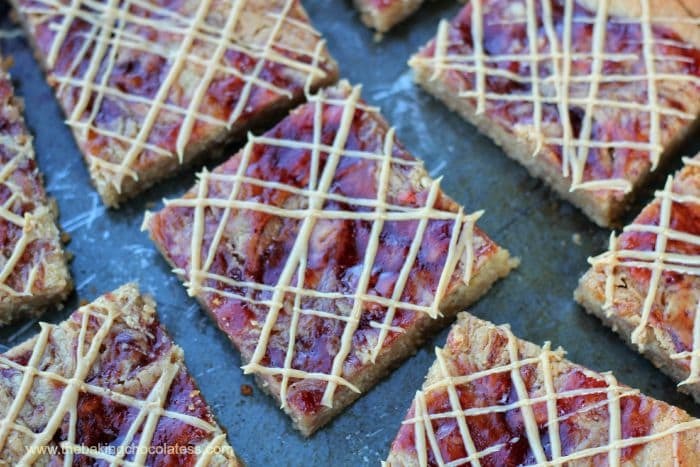 I looooooooooove everything with PB, and these bars look DELICIOUS !! Can you use natural peanut butter? Or does it need to be the sugary kind? Hi Kim, you could just reduce the baking time about 5-7 minutes, because natural peanut butter has less oil and sugar than regular, so you don’t want to overbake for moister bars. So glad you stopped by!